If you think last night’s game, the Terrier Tailgate matchup featuring Boston University and Boston College, was simply defined by winning or losing, you couldn’t be further from the truth. That’s not to say that winning losing wasn’t important. That was the point of the night. However, even with BU dropping the hard-fought, nail-biting decision to the rival Eagles, the night was still a success on the whole. For the past two years that I have been at Boston University I have tried my damnedest to make sports a larger part of the BU community than it was before my arrival in August 2013. This has not at all been an easy task. Men’s hockey never has an issue – the national title runner-up happened to produce the #2 pick in this year’s NHL draft, they had their bases covered. But having worked for Athletics for two years now we kept hitting the same roadblock. How do we possibly get kids out to these games? BU is a tough school, people have to do their work to thrive here. Then we have to compete with the rest of the city of Boston, one of the most welcoming to students in the world. Don’t even get me started on Netflix – I’m watching it in the background while writing this article. Last night was something different. Last night was something that smashed all of our loftiest expectations. To say that we were speechless in the announcer’s booth about the massive crowd would be inaccurate. That’s because we were almost screaming in delight about how many people came out on a Monday to watch BU Men’s Soccer. Last night wasn’t record breaking. No, it was record shattering. Going into tonight the record for soccer attendance was just over 5,000. We blew past the record by more than 2,000 people. Let’s take a moment to acknowledge that 2,000 people coming to anything is amazing. 5,000 is incredible, and makes sense as the standard bearer for a record. To blow past the record with that many people? Look, I’ve been writing this in my head for a while and I couldn’t put it into words if I tried. Last night’s game was won by BC according to the record books, but if you try to tell me that this wasn’t a gargantuan victory for Boston University on the whole, you’re wrong. Every member of our die-hard Athletics staff wants to thank you for your overwhelming support last night. I talked to a bunch of the players last night after the game, they all are incredibly thankful for your support last night. From me, I can’t even begin to thank you for supporting the game in any sense. I’m an optimist and my dream estimate was 5,000 people. Now comes the next step. We all in the booth were amazed by how perfect a crowd we had last night. Let’s do this more. If every game could be like this then Boston University would be one of the strongest home field advantages in the country. Come talk to our Dog Pound at the games, they are terrific people and friends that are looking to have more people chant with them. We hold in our hands the ability to make the Terrier Tailgate the beginning of a revolution. 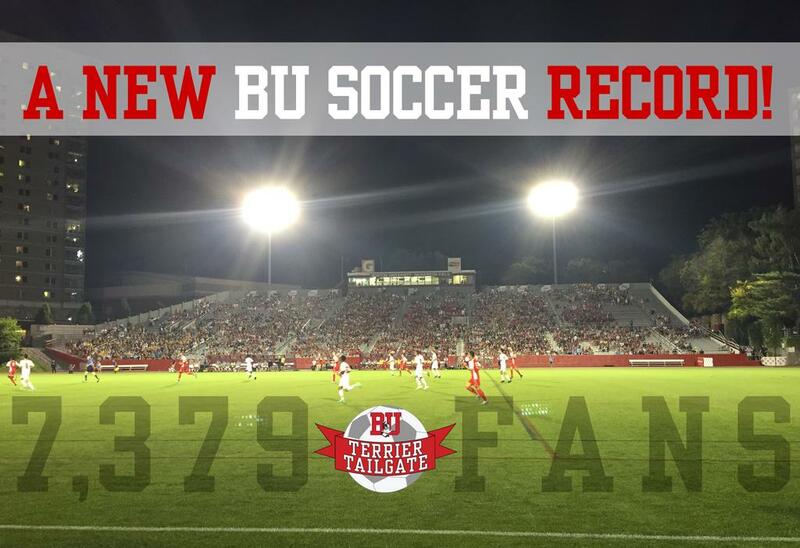 If you want to show the world that BU is quickly becoming one of the best schools anyone could ever hope to attend, let’s see you in those stands, dressed in your Scarlet and White, and cheering on your Terriers. Thank you again for all your support last night, and we hope you’ll join us again and again all school year long.